You can always put off removing the clutter from your home. After all, the only one it really bothers is you. However, when it comes to your business you don’t want to have a customer or client come into a space that is overrun with rubbish. That won’t instill confidence in them with regard to your ability to provide a service. As the end of the year approaches you should be thinking about a decluttering session with the help of Junk King Fort Worth. These are the junk removal pros that can have your business totally cleared of clutter in less time than it takes to have your morning cup of coffee! Getting rid of unwanted items from a business can be limiting. That’s because often you don’t have in a buildings dumpster. Your storage space could also be quickly overrun by all the stuff you’re hanging onto. 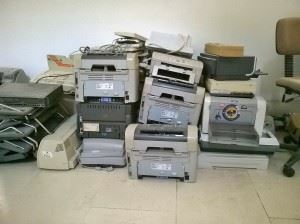 Instead, you can do a clean sweep of your business space and turn all the unwanted stuff over to Junk King Fort Worth. That includes any kind of furniture, cubicle walls, shelving, files or office equipment. That might sound like a lot to get rid of but for Junk King Fort Worth it’s all the day’s work. Junk King Fort Worth is going to provide you with a very capable moving team. These dedicated workers have a lot of experience moving all kinds of equipment and furniture. It doesn’t matter how heavy something might be or if it needs to go down the service elevator. You can depend on the crews from Junk King Fort Worth to facilitate the removal in a very timely fashion. Junk King Fort Worth makes scheduling as convenient as possible. You can set up your appointment online 24/7. Most appointments are completed by the next day but there are some same day pickups available. If you would prefer your junk removal to be handled before or after your business opens that can be arranged as well. Your schedule is what’s important to Junk King Fort Worth. As for the bottom line, you’ll find that Junk King Fort Worth’s pricing policies are extremely fair and affordable. Don’t clutter up your business with junk that should be tossed out. Give it all to Junk King Fort Worth today. This entry was posted in Clear the Clutter and tagged clutter, Junk King, junk removal, office equipment on November 23, 2016 by Cody Rodgers. Last updated August 8, 2017 .